Farrukh Saleem’s latest column includes a startling claim. He says that “the estimated amount embezzled over five years of PPP rule” is Rs8.5 trillion. TRILLION. Such a sum amounts to 8.5 percent of GDP during the five year period that PPP was in power. According to the author, this was not only due to the corruption of PPP but also could not be stopped because “Our entire anti-corruption infrastructure is designed and structured to protect corruption“. Farrukh Saleem knows the solution, though, and unsurprisingly it starts and ends at GHQ which if it is not allowed to succeed will result in “wholesale nation-wide disappointment“. There is not much in Farrukh Saleem’s piece that is surprising. He has been a long-time supporter of the military taking over more and more of the country. What is surprising is the massive number that he is throwing out. Where did this come from? I know it is fashionable to accuse Zardari and Co. of looting everything they put their eyes on, but over 8 percent of GDP may be taking the “Mr 10%” smear a little too far don’t you think? But Farrukh Saleem…excuse me…DR. 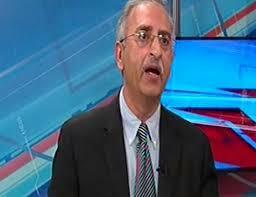 Farrukh Saleem is a respected political scientist writing for one of the largest media groups in the country. Surely some fact checking was done before this was allowed to be published. Unfortunately, my research has not been able to locate any evidence to back up Farrukh’s claim that PPP embezzled Rs.8.5 trillion. Probably he is referring to a Transparency International Pakistan (TIP) report that references a Rs8.5 trillion loss. However, this report does not say that the loss was due to embezzlement. It says the loss was due to, “corruption, tax evasion and bad governance”. Tax evasion? Bad governance? Not the same as looting, sorry. It should also be noted that this report might itself be tainted with corruption. At the time that TIP was releasing these reports that PPP leaders were responsible for looting at ever increasing amounts, many were asking whether these reports could be biased due to the cozy relationship between TIP Chairman Syed Adil Gilani and Nawaz Sharif. This was dismissed as mere rumour at the time, but these rumours appear to have been vindicated when earlier this year Adil Gilani accepted a special “first-of-its-kind” job working for PM Nawaz Sharif. Moreover, a source in the Pakistan Muslim League – Nawaz (PML-N) government told Pakistan Today that Gilani was an “old buddy” Punjab Chief Minister Shahbaz Sharif who was also instrumental in getting him appointed in violation of rules. The source added that Shahbaz had also accommodated Gilani by inking three memorandums of understanding (MoUs) with TI-P after Gilani unearthed glaring irregularities in laptop scheme. “Later, Shahbaz signed MoUs with Gilani, making sure that no further scams emerge about malfunctioning of the Punjab government as Pakistan Tehreek-e-Insaf (PTI) had exploited this scam against the Punjab government,” the source said. The source added that once TI-P was on board, no further scam was reported by TI-P and it was federal government of the Pakistan Peoples’ Party (PPP) which was later targeted by Gilani and company for allegations of corrupt practices. Wouldn’t it be ironic if Farrukh Saleem was quoting a report on corruption that was published by a corrupt organisation? Dr Farrukh Saleem is giving his opinion as a political scientist. Giving his argument the slightest fact checking, though, one cannot help but wonder if he is a political scientist, or a “politicised” scientist. This entry was posted in Blogs and tagged corruption, Farrukh Saleem, ppp, Transparency International by Mahmood Adeel. Bookmark the permalink.